Two seats in the cab. Bottom of the access stairs is foldable. Big rubber mud flaps on the front of the body. Excellent load for a truck. 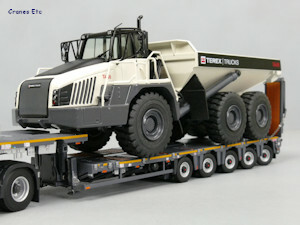 The Terex TA400 is now at Generation 10 and this model has been updated to reflect the changes. 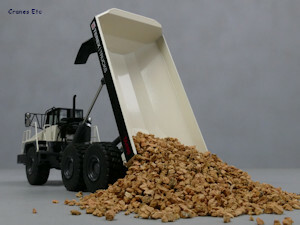 It has a maximum payload of 38 tonnes with a heaped capacity of 23m³. 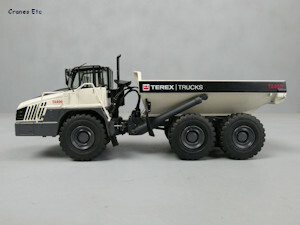 The model comes in a Terex branded box and is wrapped in soft paper and rests in a polystyrene tray. There is no information about the model or the real machine. 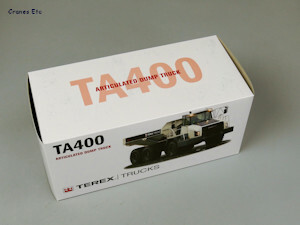 The TA400 is a solid and heavy model. 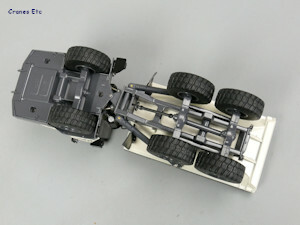 Underneath, the axles are modelled with differentials and there is a plastic drive shaft. The rubber tyres are excellent with an authentic tread pattern and they are mounted on very nice metal wheels. On the engine cover the side grilles are cast and painted black to highlight them. 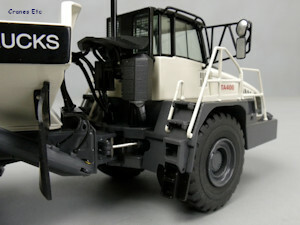 The lights are painted and there is a tiny Terex Trucks graphic. The fuel filler pipe is modelled and there are nice metal handrails. 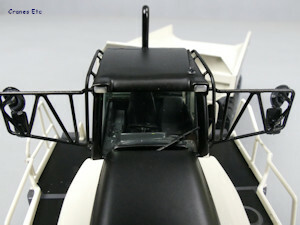 Detail around the cab is also very good with windscreen wipers, mirrors and plastic grab rails and aerial. Inside, the controls and both an operator's seat and passenger seat are provided. Behind the cab the exhaust system is very good and the window has a protection grille formed by graphics. 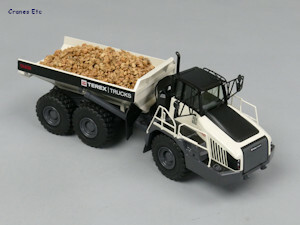 The articulation point is modelled well and there are many cables and hydraulic hoses to the body lift cylinders. 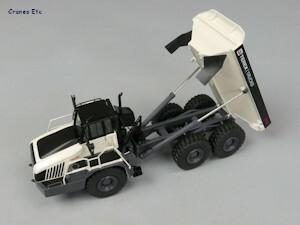 The body is of heavy metal construction and the structure is represented very well. There are two soft rubber mud flaps located at the front and the painted lights on the chassis at the rear have tiny protection grilles. 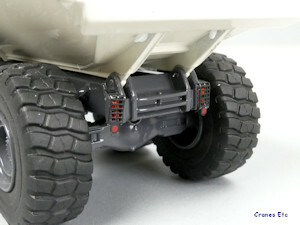 The rear axles tilt independently to allow movement over rough terrain and the range of movement is good. The articulated steering is stiff and it allows a movement to an angle of 45° which replicates the real machine. It also allows reasonable rotational articulation. The body tips well to a very good angle and the cylinders are very stiff which means that any angle of tipping can be posed. The access steps to the cab have a pivoting lower section. 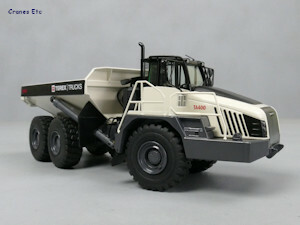 This is a nice quality relatively heavy model with a high metal content. The graphics and paintwork are very good too. 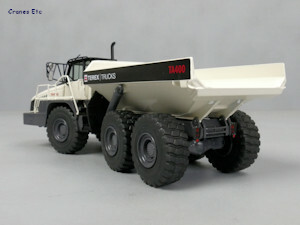 This model supersedes the previous TA40 version (model 839) and it has new details and features. 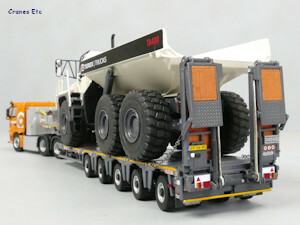 The first version of this model was released in 2006 and just like the real truck, it has gone through some iterations. 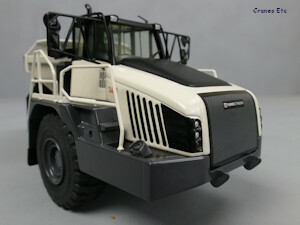 This version of the model first appeared in August 2018. Filler nozzle at the front. Very nice grilles on the rear lights.